Quickly and easily search and consult ICD-10-CM codes or construct PCS codes as needed. When done store them in a notebook and check for errors. The Index of Diseases is always available. However the Index of External Causes of Injury, the Table of Neoplasms and the Table of Drugs and Chemicals are only available with a subscription. When required (for instance in an "See or "See also" instruction) you can jump to a link in another reference. Display all relevant instructions from the Code, and its Categories, Sections and Chapters. When there are Medicare Code Edits relevant to the current code they will be annotating the code, preventing errors on your coding. Hover the mouse cursor over them to get more information about them. When there's a reference to another code in an annotation, it will presented as an hyperlink, so it can be quickly reviewed. Store your coding history, enabling returning to a previous code. Ships with the latest version ICD-10-CM in use plus all the previous ones. Make your procedure code by choosing the available characters for each axis. First pick the characters for the first 3 axis, choosing an ICD-10-PCS table. Then pick the characters for the last four axis that are in the same row for the table. When a character isn't in the same row it will be disabled but selectable. They are displayed for each character when available. Useful to clarify a character meaning, in particular on Root Operations or Body Parts. 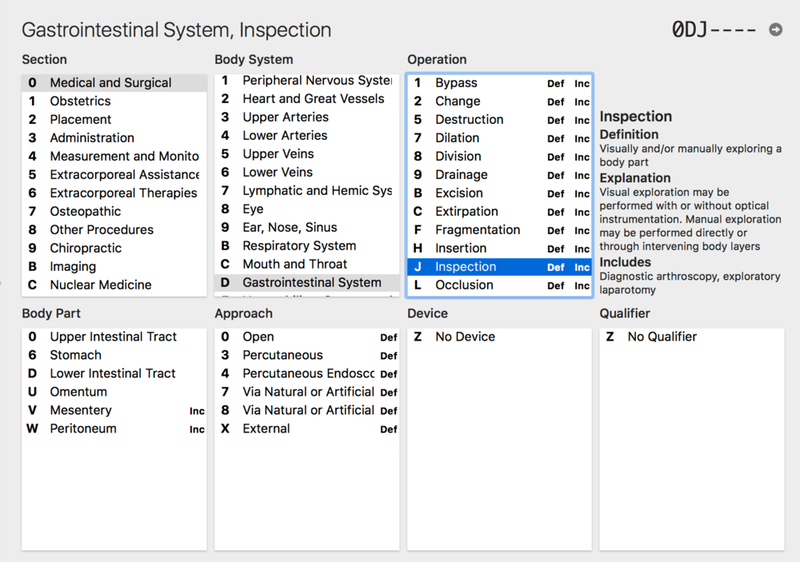 Like ICD-10-CM there's a full Alphabetic Index with procedure tables, devices and body parts. 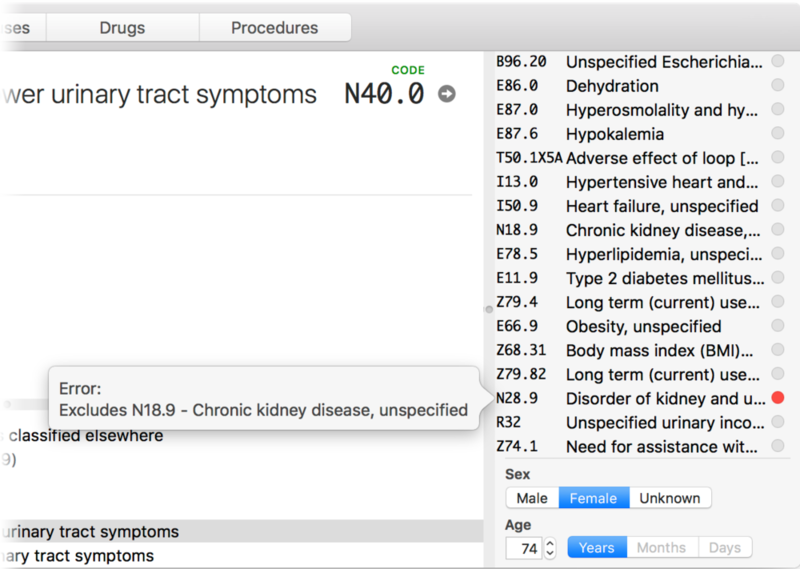 Store your selected codes for a patient in the notebook. In the free version they will be limited to 3, unlimited with a subscription. 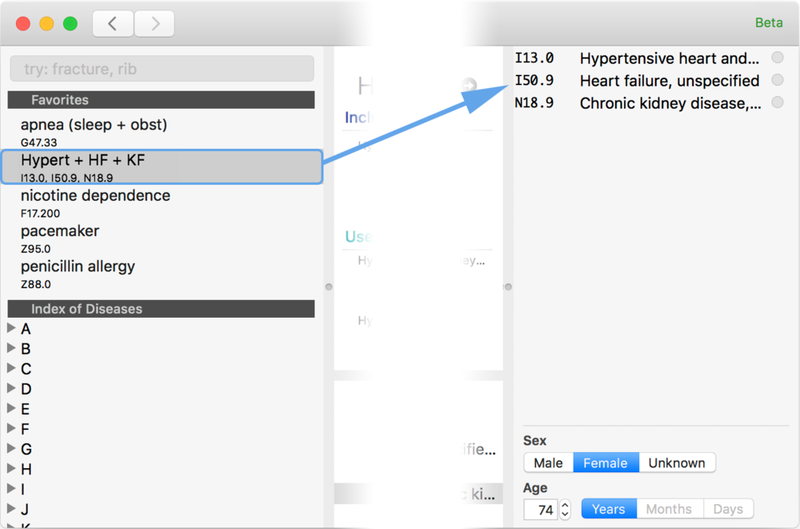 You can also select patient characteristics, like gender or age, to check if some of the codes have any conflict with them. Copy the codes to the clipboard so you can use them in another app as text. Chose codes that you use frequently, are hard to find, or are in some way used together. They will be easy to find and use as they are displayed above the Indexes. When selected they will be added to the notebook. Each favorite can contain more than one code, enabling joining codes when used together . Select a code or codes in the notebook, followed by selecting "Add to Favorites" in the menu Code or after Control-clicking them. Change the Favorite name by cliking on its title.